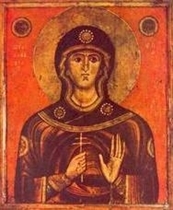 One of the most loved Bulgarian Saints is St. Paraskeva (called Petka) who lived in Epivat the XI century. When she was a young girl she heard in church the words from the Gospel: “The one who wants to follow me must renounce from himself, must take his cross and follow me!” These words of Jesus Christ moved deeply Petka. She pondered over them and decided to fulfill them. After her parents passed away, Petka decided to dedicate her life to God and she settled in the Irakliiski monastery. She spent 5 years of fasting, praying and weeping there. When these 5 years rolled away, Petka left the monastery and went to the Holy lands of Palestine and settled in the Jordanian desert. Some time later she returned to her native town Epivat, but did not find any of her relatives alive. For two years she lived in the “St. Apostles” temple in Epivat where she spent her day and night in humble prayers. Once while praying to God, her spirit was taken to the heavenly realm. The citizens of Epivat buried her as a foreigner outside the town. The place where her holy remains were buried became famous as a place of miracles: blind people started seeing again, crippled men started walking again, those suffering from incurable diseases recovered miraculously. In the XIII century Ivan Asen II carried the holy remains of Petka Paraskeva to Turnovo. Later when the Turks conquered the Bulgarian capital the remains of the Saint were taken to Vidin. After the Turks took Vidin the holy remains were carried to Serbia. In 1521 Suleiman the Magnificent conquered Belgrade and sent the remains of the Saint to Constantinople (called Tzarigrad by the Bulgarians). A century later they were handed to the Romanian ruler Yo Vassilii. Even today the holy remains of the Saint rest in peace in the town of Iash, Romania. Today the memory of St. Petka is honored in Eastern European countries. The day of her death, October 14, is the Feastday of several Bulgarian towns (Tvarditsa, Nova Zagora and Apriltsi).